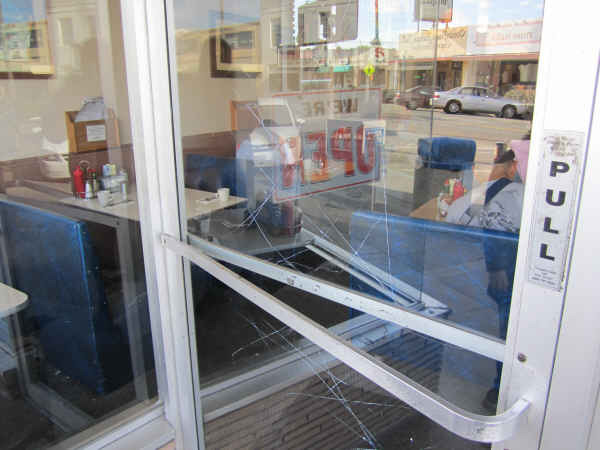 This is an update from the earlier post about the vandalism in Ocean Beach against Newport Avenue businesses. This morning (1-26-11) I walked up and down Newport Avenue taking an informal survey of the businesses who had windows and doors etched by vandals probably during the early morning hours of Tuesday, January 25th. I had heard different numbers: 30 plus businesses hit, over 90 windows or glass doors. It all appeared to be true. 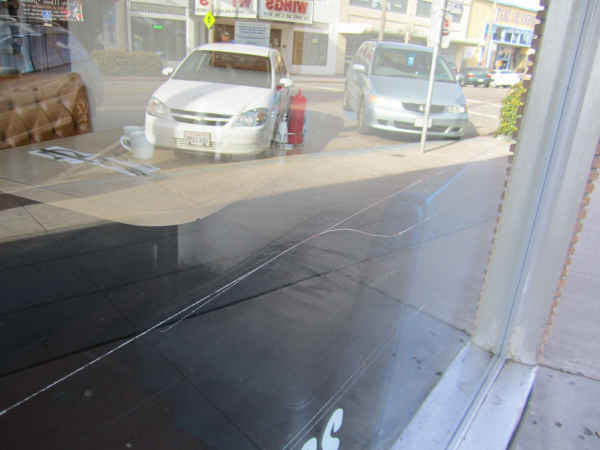 The OB businesses vandalized were mostly in the 4800 block of Newport Avenue, although a few were further west toward the beach, and some on Cable Street. The individuals responsible took something and etched out flairs, some tagger names (which we will refuse to repeat), and at one spot, actually scrawled out the words “team graffiti” – but there was no rhythm or reason to their costly shanigans. For example, the Antique Center (the former Cornet for you old timers) had 30 windows hit – they do have the most windows on the main drag. The vandals hit their brand new glass doors just replaced over the last couple of weeks. This was the worst one. But the next business over, the Closet, was left alone, yet the very next storefront, the Yogurt Farm had 3 scratches. Small businesses were victims, while Starbucks, the bank, and Sub-Way went unscathed. The police have of course been on Newport to check it all out. One business owner told me that he was informed by the Gang Detail that they think they know who did it. The repairs will be costly. Most businesses – if not all – have insurance. But most have a deductible of $500 to $1,000, which will make it tough for the small guys in these bad economic times. Some businesses have had their windows and doors tagged or broken so often that the insurance company stopped covering their windows. There are a couple of remedies some of the business people mentioned to me that could help. One such was the use of something called UV glue. But I could not tell you whether it actually works. From my informal survey, the following merchants were victimized: Margaritas, Old Townhouse Restaurant, Mallory’s, Greenlady Hydroponics, OB Hardware, Full Circle Tattoo, Gary Gilmore Goldsmith, Village Kitchen, Bone Appetite, OB Auto Warehouse, Newport Avenue Antiques, Antique Center, Yogurt Farm, Check Cash, Village Kabob (which has changed – and there will be a microbrewery called “The Joint” opening up there), the other Mallory’s Furniture, Nicos, Miss Match, the glass door to the arcade, the Electric Chair, and Wings. Some businesses off Newport on Cable were also hit: Loan Ranger, Bernies Bike Shop, the empty storefront next to the alley, OB Laundrymat, B’s Hair and Nails. There may have been a couple I missed, but I did look at the windows of everyone on the Avenue. It is no consolation, but many of the scrawling were not too visible, whereas a few were highly noticeable. Unfortunately, there is no easy answer to all of this. Who knows why the vandals struck. They were not anti-corporate hooligans, and the costs for their maliciousness will be born by these small merchants. Some may not repair the glass at all, while others will be forced to. And some of those costs will probably fall on the customers. Here is an update from SignOnSanDiego here. You know you can by these really cool sprinkler systems with motion detectors…..
Here’s a link to the video showing the 3 kids responsible, as well as our very own Gary Gilmore! Way to go Gary!! Somebody needs to pass this information along to El Cajon Police Department. Right across the street from Vons on Broadway & 2nd on the south west corner of the CVS Store there is a ‘red’ spray paint tag that matches the OB vandals. I hate taggers they should all have their thumbs cut off! Where caught and prosecuted…..they must be banned from OB FOREVER! What a bunch of losers….doesn’t saw much for their parents that taught them no values or to respect others. Way to go Greenlady, Gimore, TV news, etc. for help spreading the word about these thugs. IS OBMA offering a reward for the capture and conviction of the vandals?